More than 12 years ago, while eating out with our daughter and her husband, they informed us we would become grandparents the following spring. I should have celebrated big time. After all, many grandma wannabes lock their children with spouses in guest rooms until they agree to produce offspring. I did not — not because I didn’t want to become a grandmother. I just planned to do it 100 years hence. So I indulged in a few weeks of “But I don’t take Geritol.” Then I reacted like any grandma. Commandment 1: When informed, thou shalt throw a New York City ticker-tape parade — unless thy children aren’t excited. In that case, distribute hugs, then throw a private ticker-tape parade. Commandment 3: Thou shalt express enthusiasm at thy children’s choice of names. Thou shalt not require them to name their child after you nor after Uncle Ferd, though your family has included a Ferd every generation the past 3,000 years. Instead, cheerfully enter into the family Bible the name of a video game warlord from the planet Pzorxx. Commandment 4: When news of imminent birth reaches thee, thou shalt not assault the officer who stops thee for speeding. Thy new descendant does not need a convicted felon for a grandparent. Commandment 5: Thou shalt enter labor and delivery only when asked. Then, thou shalt not point thy phone at the mother and tell her to smile. Commandment 6: Thou shalt not mug visitors who dare suggest thy future Miss America is bald. See Commandment 4 regarding assaults. Commandment 7: Thou shalt resist the urge to sterilize their family dog’s tongue. Commandment 8: Thou shalt reassure the mother that newborn upchucking will not result in a reduced IQ. Commandment 9: When events fall outside the other commandments, duct tape thy mouth — and that of thy spouse — shut. Then thou shalt cook, clean, and launder, bringing joy, gladness and clean underwear to their household. 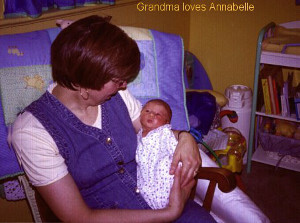 Commandment 10: All of the days of thy life, thou shalt love, nurture, and pray for this grandchild. Then someday, with deep gratitude to God, hand these commandments over to thy children. What commandments do you suggest make the new-grandparent list? This entry was posted in Coffee Corner, Uncategorized and tagged children, Faith, Family, God, Grandchildren, Humor, Moms, Rachael O. Phillips on January 25, 2017 by rachael.